I’ve said it before, but I’m a huge sides person. Especially if that side is corn, and even moreso if that side is grilled corn. The sweet, crunchy, and charred combination gets me every time and I could eat just a heaping plate of it and be happy…and often do. 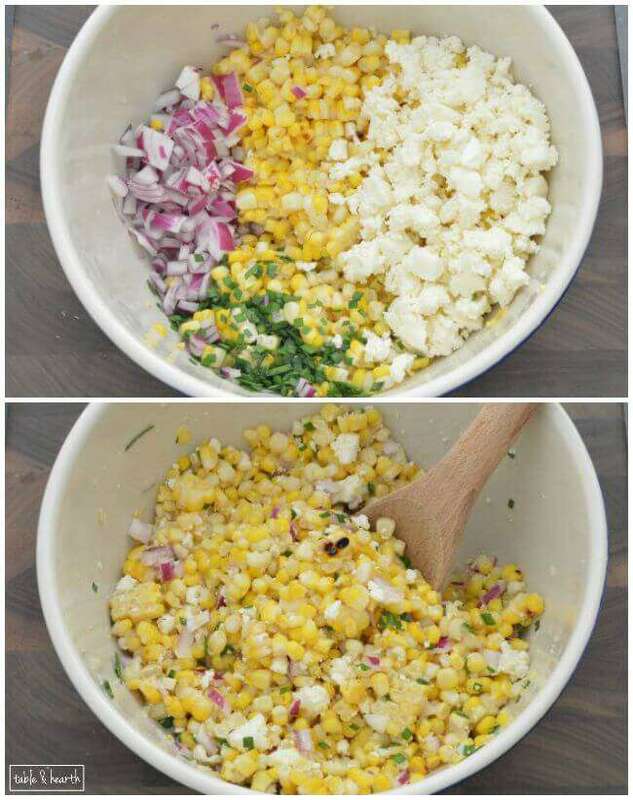 So this Roasted Mexican Corn Salad recipe from Your Homebased Mom was a must-pin as soon as I saw it. We had the grill out for some mahi-mahi that we caught this weekend, so I had Matt grill up a whole bunch of corn while he was at it (I didn’t do the mayonnaise thing the recipe suggests though, I will next time). I always try to have him grill things for me to use later while he has it out, like peppers and veggies, because I don’t operate the grill myself. I’m not even sure I’m allowed to actually. 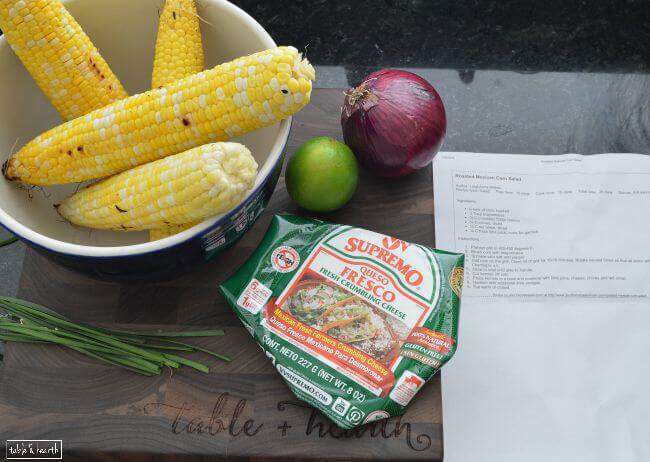 After grilling the corn, it’s just a matter of mixing it with the other four ingredients. But I have to admit something real quick… I never cut kernels off of the cob until just a few years ago and it changed my life y’all. We always ate it off the cob, frozen, or from a can growing up. I HATE eating it off the cob but never was I shown to (or thought to) cut the kernels off of it. Huge DUH! moment right there. Anyway, so after cutting the kernels off the cobs, then mix with the other ingredients. The amount of flavor that you get with just five ingredients blows me away! It’s so super fresh and crispy which is perfect for a summer potluck or cook-out. And any excuse to use crumbly Mexican cheese is reason enough for me. Although I still have yet to find the cotija cheese at the store, but luckily we have a zillion other Mexican cheeses like it to choose from (literally). My favorite so far is this Queso Fresco. 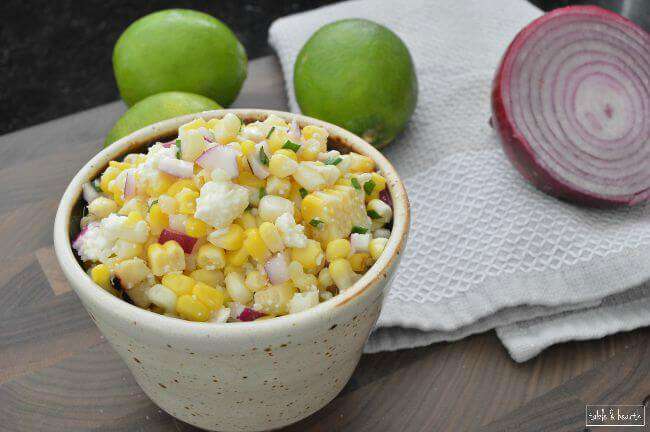 This is totally my new favorite side dish and every time we have the grill out now I’m going to put like eight cobs on there so that I can make a big ‘ol batch of this. 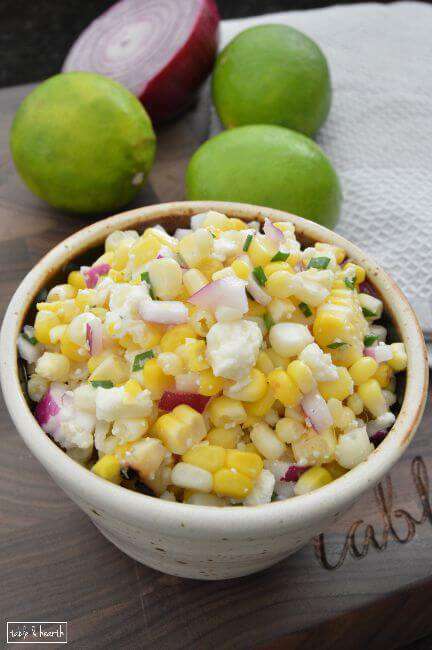 Maybe with a little paprika or something to have a little Mexican street corn action. And likely to eat for lunch, not as a side to anything. That is if I don’t eat it all right after making it like I almost did this time! Find and pin the recipe HERE! What are your favorite summer recipes? Do y’all have a great grilled veggie recipe you always turn to?